Established in June, 2008, Focalprice.com (read review) are now celebrating their 5th anniversary by offering a series of big sales, just like many other Chinese stores usually do. As a buyer, you are always encouraged to take advantage of such rare opportunities to make huge savings if you are interested in shopping commodities with Chinese suppliers. Generally, the China-based online stores would offer extremely attractive discounts for their anniversary sales and Focalprice.com is definitely not an exception. Focalprice have launched a two-week sale as the first promotional campaign for their 5th birthday. The promotion lasts from May 17 to May 30, 20013. 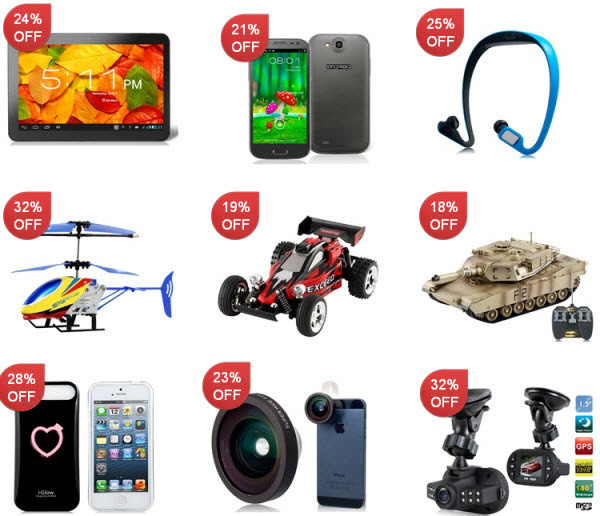 During this period, you can get up to 36% off on a range of select products, including tablet PCs, cell phones, sports earhooks with MP3 player, car vehicle cameras, wide-angle lens for iPhone 5, port audio crystal extension cables, plastic and silicone cases with heart shaped stands for iPhone 5, bathroom safety bar handles, pet apparel, RC helicopters, RC racing cars, RC battle tanks, leather bracelets, snakeskin faux leather wallets, faux leather leopard wallets, depilators with LED light and Rilakkuma speaker with LED indicator and USB flash drive & TF card reader. For details like the specifications, prices, discounts or warranties, please click here. As a international shopping website particularly well known for cool gadgets, Focalprice.com is always listed as one of the best candidates when it comes to selecting a reliable Chinese online retailer of wholesaler to shop electronic gadgets with. Besides the most widely sought-after mobile and networking devices such as tablets and cell phones, they also carry an amazing variety of accessories for popular gadgets like iPhone, iPad or Samsung Galaxy. Competitive pricing is one of their biggest attractions and better customer ratings help make them one of the best Chinese electronic stores that deserve your trust. In particular, I noticed that the tablet PCs and cell phones included in their 5th anniversary sale are all the latest models using advanced OS Android 4.1 or Android 4.2. The prices for the gadgets are unbeatable after the discounts. Plus, they are available for free shipping to any destination around the world. If you are looking for best valued made-in-China tablet PCs or cell phones that are popular in 2013, their anniversary deals are worth checking out. Even if you fail to find any on-sale product of your interest from the Focalprice.com 2-week anniversary sale collection, you are encouraged to wait for the next sale and you may find the one you like. The 5th anniversary sales of Focalprice.com have just started and more deals with even greater discounts will come out in June. I will post their lasts anniversary deals here as soon as they are released by the site. Just check back here regularly so you won’t miss out the best deals.